First of all, I LOVE, LOVE, LOVE this project. SO MANY applications! As I worked with it though, I did realize a couple of things I would have preferred to do. For example, decorating the flaps first. I found it harder to do this once the box was assembled. especially when stamping or drawing on it. Also, I had to darken the score lines (when I glued it together I turned it "inside out") and make a paper copy to cut out the hexagon to use as a pattern to cut out my image for the bottom inside. 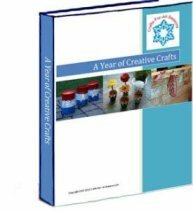 Response from Crafts For All Seasons: Thank you for posting such wonderful tips and suggestions! I'm so glad you enjoyed the project.